Canada Post offers a wide range of tracking services for your parcels and letters, with different options for individual and business customers. Individual customers can enter their tracking number into an online form, which will then deliver real-time tracking information. Users can track their shipments on top of this website, which is free of charge. Customers customers can access information about when their order was entered into the Canada Post system, when the firm received it and when staff delivered it to the final address. They can also check whether a notice card was left if delivery was not possible. For customers mailing packages outside of Canada, the tracking service allows them to see when Canada Post transfers their package to foreign delivery firms, when it has been delivered to an address abroad and whether a card has been left to notify the recipient that delivery has failed. However, the tracking service is not available for all packages. Registered Mail International, Small Packet USA and Small Packet International are all excluded from the service. Recently, Canada Post also announced that tracking would no longer be offered for International Inbound Packages, although the firm would continue to require a signature as proof that packages have been delivered. 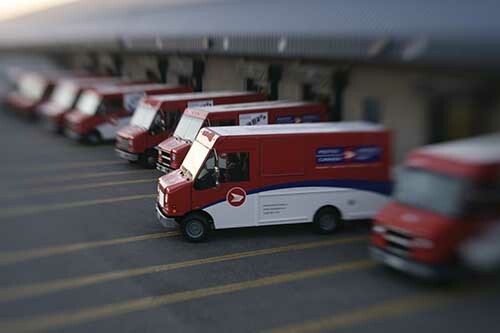 The different types of mail currently covered by the Canada Post tracking system include rapid delivery via the Priority class – which promises next day delivery on local and regional deliveries within Canada. Xpresspost offers a slightly slower service, while the Regular class of delivery offers local deliveries within two days and national deliveries within nine days. Canada Post has embraced digital technology to assist with their mail tracking systems. Customers can download an app from the iTunes app store, which allows them to track any item, wherever they are. The app is simple to use, only requiring users to enter their tracking number, and clearly displaying any outstanding orders. As they arrive, they are marked off in green, allowing any customer to see at a glance, which packages remain to be delivered. Canada’s official Post Office was founded in 1867 to provide an efficient means of communicating across vast distances in what was then a British dominion. Initially modeled on the British Post Office, Canada Post soon encountered difficulties that the British service would never confront – how to serve remote rural communities located hundreds of miles from the nearest city. In 1908, the organization started to offer free rural deliveries anywhere in Canada, a move which stimulated the development of new forms of mail delivery. By 1918, Canada Post had introduced its first Airmail service, conveying packages from Montreal to Toronto. Since then, the Post Office has played a key role in knitting together communities across Canada. However, things haven’t always been easy for Canada Post. In the 1970s, the Post Office registered major losses, leading to a reform in 1981 (when the Canada Post name was agreed upon). The service became a Crown Corporation and was reorganized to retain universal deliveries, while saving money and raising efficiency. The first area is Transaction Mail, which covers ordinary letters, with rates that vary depending upon the weight of the letter. As of 2015, the rate for a standard weight letter (30g) was set at 85 Canadian cents, although the cost rises every year broadly in line with inflation. The organization stipulates a set of standards for transaction mail deliveries, with a target of delivering any letter within 2 days. Different rates apply for international mail. For example, a letter posted from Canada to the USA will cost around $1.20. 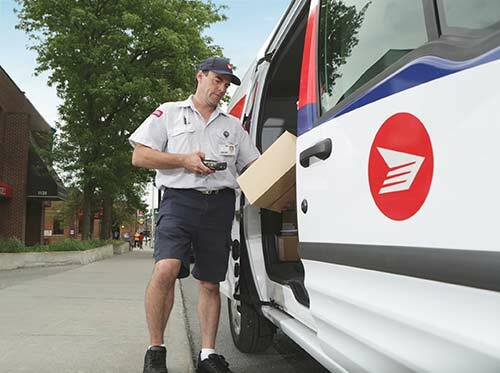 The second area of Canada Post’s service is parcel delivery. Domestically, parcels of up to 30 kg in weight can be delivered at four different rates. Regular parcel delivery can arrive in 2 to 13 business days. Expedited parcels cater for businesses only and arrive in 1 to 13 business days. Xpresspost covers parcels and documents, and will arrive in 1 to 2 business days (or up to 7 for very remote locations). Finally, priority parcel deliveries are the fastest available and offer next day delivery to Canadian cities. International parcels are divided into different classes based on weight. Light packets weigh up to 500 g with set maximum dimensions. Small packets weigh up to 1 kg for deliveries to America, or 2 kg for international packages. Neither light packets nor small packets can be tracked at present. Expedited parcels weigh up to 30 kg and can be tracked, while Xpresspost parcels offer rapid, reliable deliveries to the USA. The fastest international service offered by Canada Post is their Priority parcel delivery service, which is operated in conjunction with Federal Express, delivers across the world in 2-3 business days and can be fully tracked at all stages. The third class of mail handled by Canada Post is Direct Marketing. This involves bulk postings of advertising mail, with a minimum quantity of 1,000 items. The firm also offers a service called Snap Admail, which supports businesses in devising direct marketing campaigns. 2015 financial statements show that Canada Post made a profit of $24 million in the first quarter of the year, and a profit of $194 million in 2014. From 1995 until 2011, Canada Post regularly posted profits, but in 2011, the firm announced losses of $253 million, a profit of $98 million in 2012 and a loss of $269 million in 2013. This volatility sparked organizational changes, which have seen profits stabilize. The recent financial success of the firm has been attributed to the sharp rise in packages and letters being sent by eCommerce businesses across Canada, with revenues from parcel deliveries increasing by $39 million compared to 2014. Canada Post currently handles around 800,000 parcels every day, and the total is rising. Parcel revenues may be increasing, but Canadians are sending fewer letters via the mail. According to Canada Post’s own figures, the number of letters sent in the country fell by 1.4 billion per year between 2006 and 2014. The changes in Canada’s postal market mean that Canada Post is moving towards new forms of mail delivery. In the past, the company has operated a ‘door to door’ delivery method. However, it is currently moving towards the use of community mailboxes, instead of catering for individual homes. The firm has pushed through price increases on stamps in recent years, and also has plans to reduce employee numbers by 8,000 in the next 5 years. Despite the calls for organizational change, and volatile financial performance, Canada Post remains a public body. There has been talk of privatizing its operations in order to enhance labor productivity and open the postal market up to competition. This has been strongly resisted by trade unions and citizens’ groups in Canada, and there are no current plans to force through privatization. Charity is a major concern for Canada Post, and the company runs the Canada Post Community Foundation to channel revenues into deserving causes. The foundation focuses on organizations and programs that benefit children in Canada, such as educational institutions, improving nutrition, support for those with special needs and mental health programs. In 2013, the foundation disbursed over $1.5 million in grants to community groups. One of the most popular areas of Canada Post’s operations is its festive Santa Claus service. Children from across the world tend to see Canada as a possible location of Santa Claus’ home, and the Canadian postal service receives a huge volume of mail every year. In response, Canada Post has set up a dedicated post-code for Santa (H0H 0H0), and mobilizes a team of 15,000 current or ex-employees to answer messages at Christmas time. 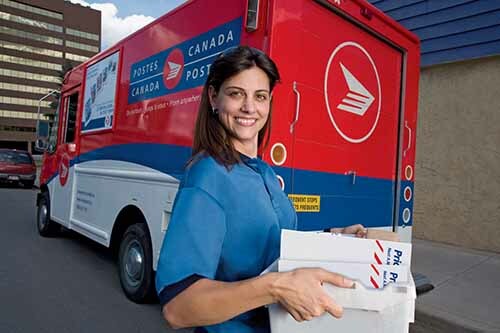 Canada Post offers a wide range of different job opportunities across its organization. Jobs available could include everything from engineers, fleet mechanics, letter carriers, procurement officers, sales staff and mail supervisors to accountants and corporate lawyers. The organization is regularly voted one of Canada’s 100 best employers to work for, with generous employee compensation packages, including health-care plans, paid sick-leave, parental and compassionate leave. Under Canada’s Employment Equity Act, Canada Post have also committed to ensuring that their workforce is representative of the country’s ethnic diversity. Canada Post operates branches in communities across Canada. Their support team can be contacted via Twitter (@canadaposthelps) or Facebook. Telephone enquiries regarding order tracking can be made to: 1-866-607-6301 (within Canada) or 416-979-3033 (outside Canada).